Bisbee, Arizona is a very artsy town - "artsy-fartsy" as my mother would say. If you're looking for eclectic, you've found it. Lots of galleries in town, but mostly it's the art on the residences, buildings, front yards, and even cars. 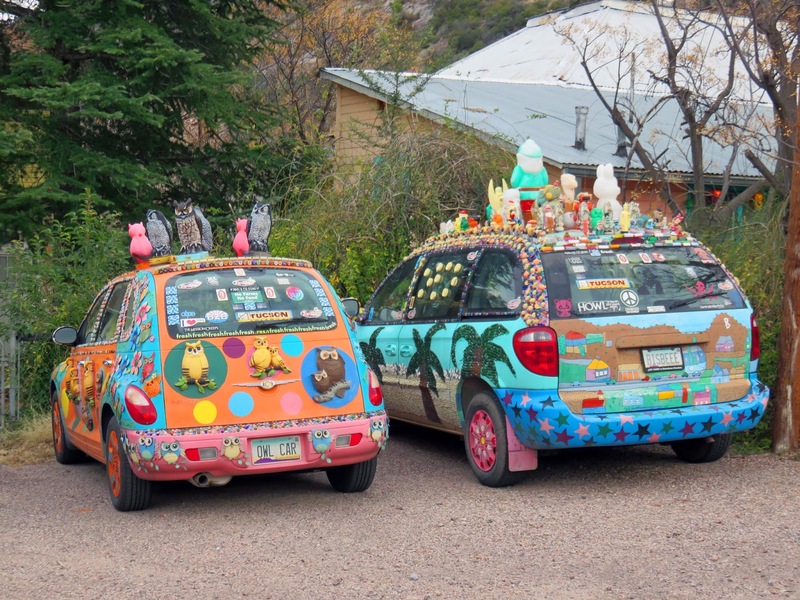 I saw these cars and was so busy taking the picture, I said to Ed, "Did you see that one? It had owls all over it." "Yeah, I saw it." he said. "It's an owl car." I said. "An owl car?" he said. "It's got owls all over it. Like, everywhere. Even on the sides." I said. "It says owl car on the license plate." he said. "Yeah, you didn't see it? I thought that's why you called it an owl car." he said. "No, it has owls on it. 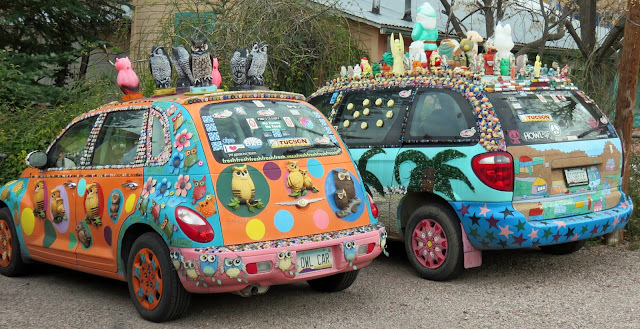 That's why I called it an owl car. I didn't even see the plate." "Seriously, I didn't see it." I laughed. Really, I didn't even see it. But damn, if anyone is going to have OWL CAR on their license plate, that's the car to put it on. And this is the place for it to be. Bisbee. A paradise for creative people.